Spheroids are an important step in evaluating more accurate in vitro cancer models. Better models are necessary to be able to gain knowledge efficiently which can lead to finding alternative methods of treating cancer. The aim of the following ongoing project is to study the possible spheroid formation of lung cancer cells after 3D bioprinting in various of bioinks. Spheroids are multicellular cell aggregates that form via ECM fibres that link singles cells together through integrin binding. The cell-cell contact lead to an increased E-cadherin expression and these E-cadherin interactions generated the formation of the compact structures. Spheroids are more complex then single cells due to dynamic cell-cell and cell-matrix interaction which makes them an important tool for resembling the in vivo tissues microenvironment in vitro. 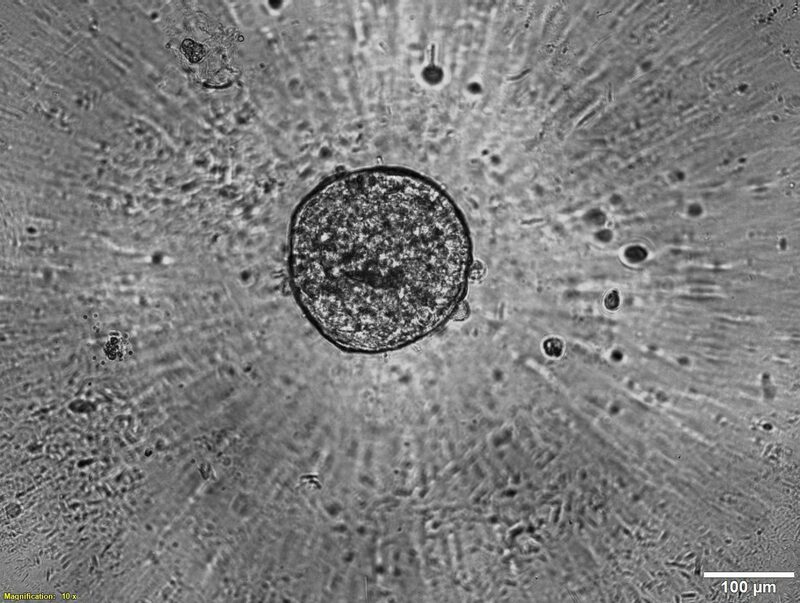 The image beside show a compact spheroid formed in a 384-well plate after nine days of culture. 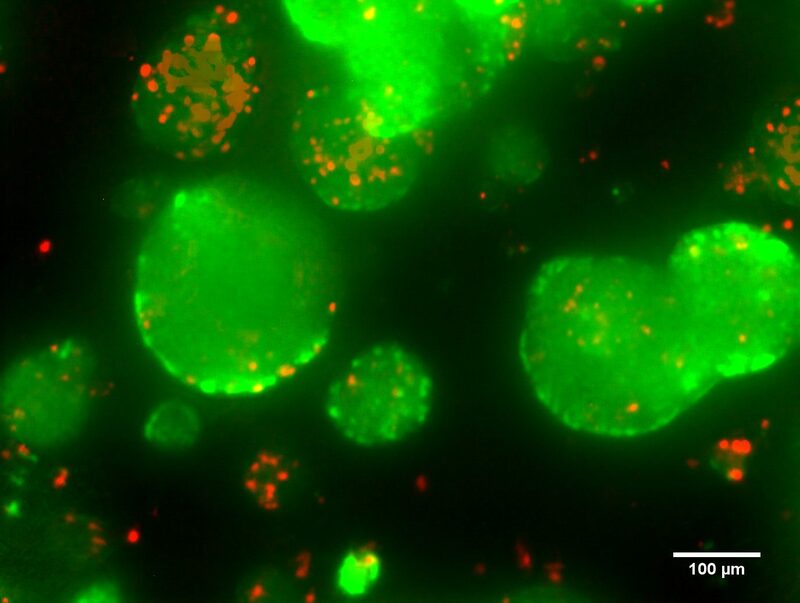 In this project 3D bioprinting was used to investigate the spheroid formation of several lung cancer cell lines. After mixing the cells into the bioinks, small droplets were printed in 96-well plates. The droplets were cultures for 14 days where visual observations of the cell aggregation were performed daily in a bright-field microscope. 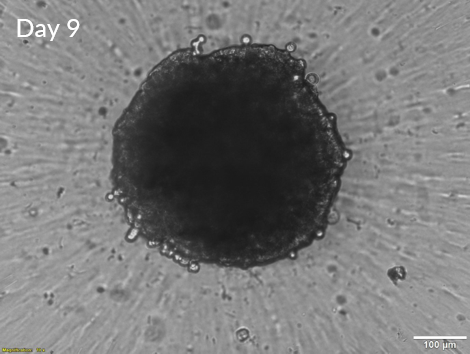 Spheroid formation was detected after 14 days in culture which can be seen in the bright-field image beside. The image display three spheroids at the edge of the construct. Viability studies were conducted at three different time points and the constructs showed high cell viability throughout the 14 days. The image beside displays the result from the live/dead assay where the cells display high viability 14 days after printing. The green represent living cells and the red dead cells. 3D bioprinting of lung cancer cells in different bioinks enables the cells to cluster together and form spheroids with a high viability. 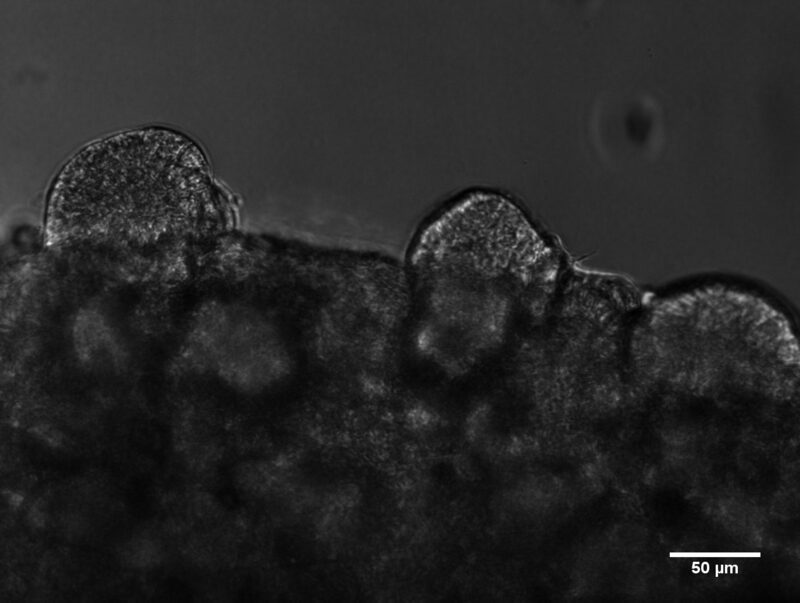 Further investigation of various of bioinks will be carried out to find out which bioinks will enable the cells to form spheroids inside the bioprinted constructs.